Local, Heated Front Seats, Cloth Seats, Driver's Power Seat, Steering Wheel Controls! The 2017 Toyota RAV4 provides a strong blend of fuel efficiency, ride comfort, cabin room, and reliability. 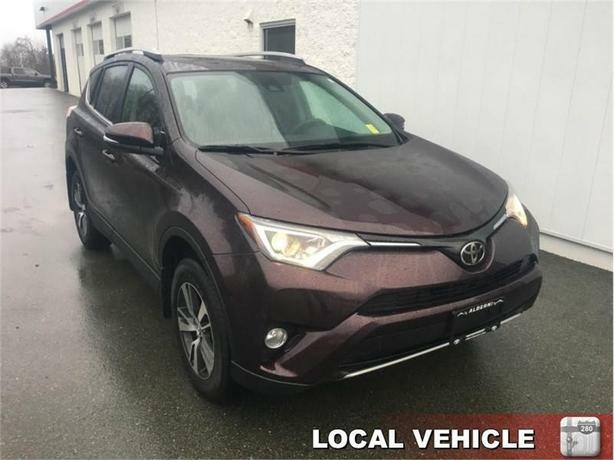 This 2017 Toyota RAV4 is for sale today in Port Alberni. The 2017 Toyota RAV4 is designed to help you make the most of every moment thanks to its responsive handling, striking sporty design, and a premium interior that features state-of-the art features. The dramatic and sporty exterior design will captivate you from headlamp to tail light. The spacious and versatile interior features premium materials and a long list of intuitive technologies for driver and passengers alike.This SUV has 11998 kms. It's black currant metallic in colour. It has an automatic transmission and is powered by a 2.5L I4 16V MPFI DOHC engine. This vehicle has been upgraded with the following features: Heated Front Seats, Cloth Seats, Driver's Power Seat, Steering Wheel Controls, Back Up Camera, Air, Tilt. Our RAV4's trim level is FWD XLE. Generously equipped and well built, the 2017 Toyota RAV4 FWD LE comes standard with features such as upgraded aluminum wheels, power sunroof with sunshade, heated side mirrors with turn signal indicators, power tailgate, front fog lamps, power windows, power door locks, 6.1 inch audio display, Bluetooth, SIRI Eyes-Free, 6 speaker stereo, backup camera, heated front power bucket seats, roof rack rails, remote keyless entry, distance pacing cruise control, dual zone automatic air conditioning and a smart array of safety features such as forward and rear collision alert, blind spot sensor, lane keeping assist, lane departure warning and more.